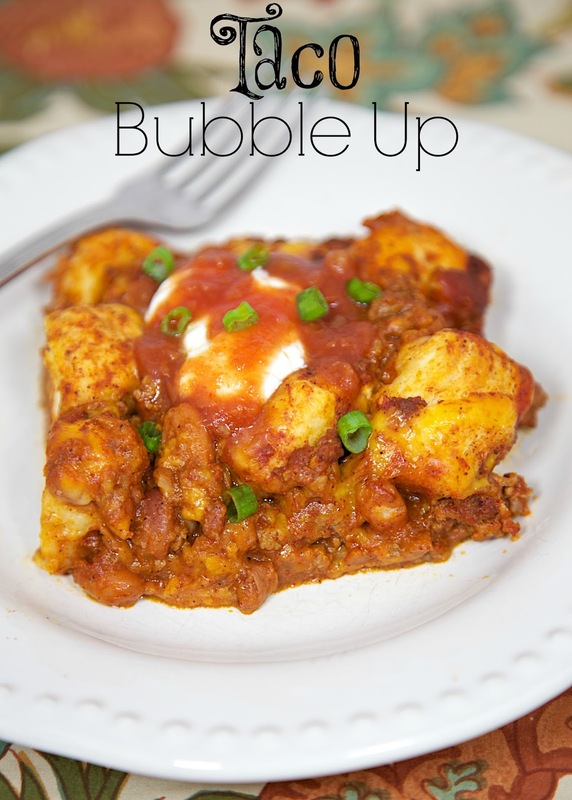 Taco Bubble Up Recipe - taco meat, beans, salsa tossed with refrigerated biscuits - fun twist to taco night! Quick Mexican recipe with everyday ingredients. Top with your favorite taco toppings!! I was looking thorough all our Bubble Up recipes and couldn't believed that we had never done a Taco Bubble Up. I had to remedy that situation! It turned out great! Taco meat, tomato sauce, biscuits, cheese and onions. YUM! 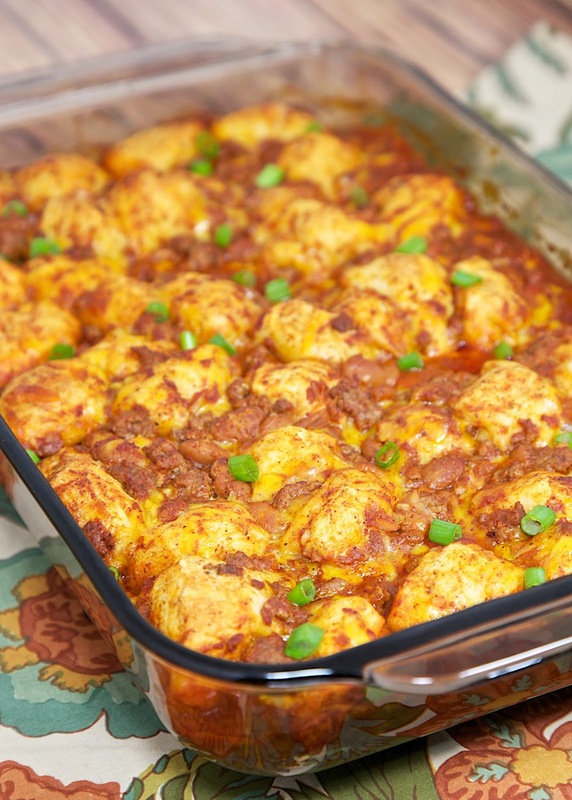 We topped our casserole with sour cream and salsa. If you want to take a little short cut with this recipe, you can cook the meat ahead of time and refrigerate or freeze it until you are ready to make the bubble up. I don't suggest freezing this casserole unbaked. The refrigerated biscuits won't rise as well after they have been frozen. One note - I use Pillsbury Grands Jr Biscuits. The 12oz can. I find that they don't crowd the pan and cook up in under 30 minutes. If you only have regular Grands biscuits, cut them into 6 pieces and toss one of the biscuits out. In a skillet, cook hamburger meat until no longer pink. Drain fat. In a large bowl stir together cooked meat, taco seasoning, pinto beans, tomato sauce, water, salsa and cheese. Remove biscuits from can and cut each into 4 pieces. Toss with meat mixture. Pour biscuit mixture into prepared pan. Spread biscuits out if they are clumped together. Bake for 25-30 minutes. Serve with your favorite taco toppings. Can the bubble ups be made ahead of time and frozen?